We continue our recruiting series that highlights the top 2015 recruiting targets that Texas A&M is still looking to land. There are 6-8 spots left and several elite prospects in the fold. So far, we have covered Malik Jefferson, Kendall Sheffield, and Kirk Merritt. The Aggies have the luxury of one of the youngest, deepest, and most talented receiving corps in the nation. With the likes of 5-star freshmen Ricky Seals-Jones and Speedy Noil in the starting lineup along with breakout sophomore Josh Reynolds, the future is very bright for years to come. This young talent was presumably a major reason for DaMarkus Lodge’s decommitment who is likely seeking a starting lineup he can crack next fall. But his decommitment hasn’t slowed down the coaching staff one bit. With several of the nation’s top wide receivers considering the Aggies, the rich could get richer come 2015. Christian Kirk has been on David Beaty’s wish list for several years now. 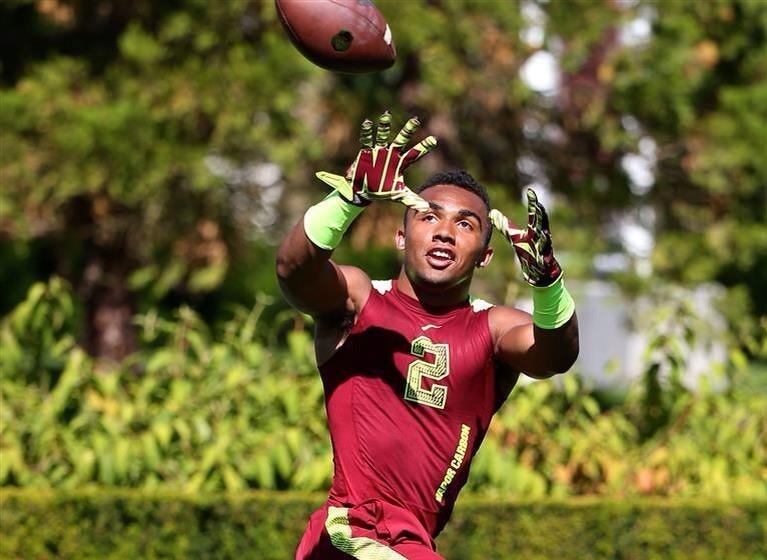 The 5-star wide receiver is 5’11” 190lbs. and is listed as the 3rd best receiver in the nation. From Arizona, Kirk has always expressed an interest in playing with fellow Arizona native Kyle Allen. When the 5-star quarterback committed to A&M this past February, the Aggies instantly became serious contenders in Kirk’s recruitment. And now that Allen is A&M’s starting quarterback, the Allen to Kirk connection looks to be more likely than ever. This past Friday, Kirk set the Arizona state record for career receiving yards with a total of 3,739. And with 193 catches and 50 touchdowns over his high school career, he is averaging 19.4 yards per catch and scoring a touchdown once every 4 receptions. The highly sought after receiver has an offer list larger than anyone I’ve ever seen. He has taken official visits to UCLA, Auburn, Texas A&M, and most recently Arizona State. And while this recruiting battle could be a close one, expect the 5-star to be sold on the opportunity to play with Kyle Allen and take over the void left by departing senior Malcome Kennedy.